Bike share is an extension of public transit providing on-demand bicycle access for short urban trips. Bikes are checked-out from one station and ridden to another near one’s destination for check-in. In one common implementation, a membership fee allows repeated short bike trips of up to 30 minutes at no additional charge. Bike share can extend a transit system’s range, providing “last-mile connections”, and can also improve access beyond scheduled service hours and frequency. 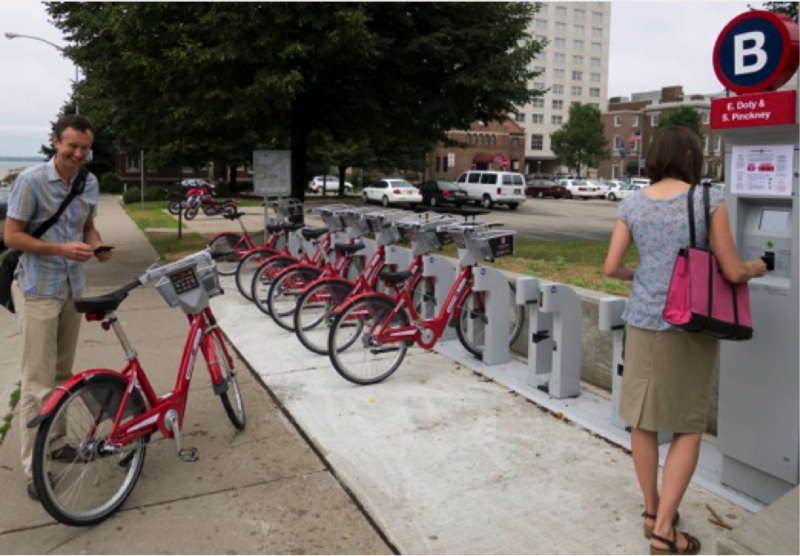 Bike share systems have been quickly spreading across the US over the past several years. Systems in New York, Chicago, and Washington DC have made headlines, but many smaller cities have implemented some version of bike share. In Wisconsin, Madison has had its B-Cycle system running for several years, and Milwaukee recently launched Bublr Bikes. The recently adopted Portage County Bicycle and Pedestrian Plan recommends that Stevens Point conducts a feasibility study for a small-scale bike share system connecting destinations downtown and on the UWSP campus. Wisconsin Rapids recently established their own version of a bike share system. Dubbed River Riders Bike Share, their system is based on earlier-generation bike share models that rely less on high-tech stations and more on community partners. Learning about bike share in Wisconsin Rapids will be helpful to those interested in making bike share a reality in Stevens Point. This Friday, there will be an opportunity to hear about the Wisconsin Rapids experience and to discuss the potential for bike share in Stevens Point. As part of the Point and a Pint series, two founders of River Riders Bike Share will present on their experience in Wisconsin Rapids. This will lead into a broader discussion of bike share possibilities for Stevens Point. The Point and a Pint bike share presentation and discussion will take place this Friday September 12 at 6 PM at Kristin’s Riverwalk (1140 Clark St in Stevens Point). There is no charge to attend and participate, and all are welcome. Nathan Sandwick, the organizer of the Point and a Pint series, requests an RSVP at nathan(dot)sandwick(at)ces(dot)uwex(dot)edu, but drop-ins are certainly welcome. If you want food or a beverage – which is optional – it is recommended to arrive around 5:30 PM to get settled and give the waitstaff the opportunity to take your order. For more info about this Friday, visit the Point and a Pint bike share event webpage. You can also learn more generally about the ongoing Point and a Pint series and what to expect at these networking opportunities here. I look forward to stimulating discussion about bike share with lots of Poky Pedalers on Friday. This entry was posted in All Posts, Education, Stevens Point Area. Bookmark the permalink.